Made of stainless steel,the non-slip rubber handle prevents your hands from sliding or sliding when opening any beverage bottle. The easy-to-grip bottle opener is soft and sturdy,suitable for professional bartenders or families,bottle openers,easy-to-open levers, aluminum foil cutters and beer bottle openers. Save a lot of space in your kitchen or dorm room;you can store the bottle opener in any kitchen drawer so it's hidden out of sight. Alternatively,you can use the hanging holes on the bottle opener to hang on the wall to make direct contact every time you need it. Use the top of the hole to open beer,soft drinks,soda,coca cola,etc.It is perfect for professional bartenders or families. All products are 100% physical pictures,no special effects picture software,please rest assured to buy. If you have any questions,we recommend consulting the customer service department and thank you for your support! 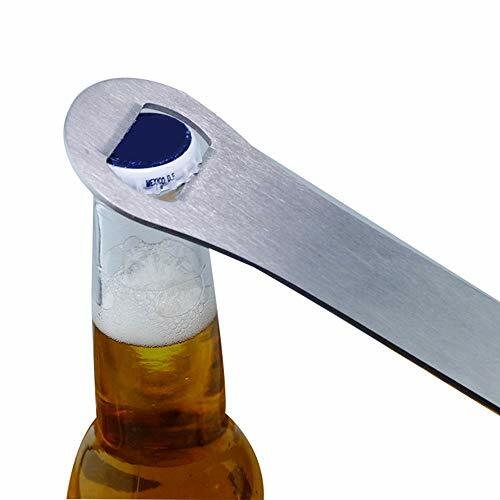 Bottle opener,easy to open lever,aluminum foil cutter and beer opener. View More In Jar Openers.